Fish Are Peculiar | Hujambo! About a month ago Cassandra bought a fish tank and populated it with a few fish: a Plecostomus, four Platys, and a Siamese. What started as a fun weekend project has turned into a strange month of fish keeping. Or so we thought… One day the aggressive male Platy was bottom up. A few days later Cassandra came home from work and found Atilla (the Siamese) dried up on the floor next to his tank. We replaced the Platy and threw in a handful of guppies for the hell of it, but he’s been acting weird from the second we dropped him in the tank! I’m not sure if he’s playing dead or actually dying, but he lies down on his side all day, occasionally swimming to the top to grab some air or food or something. And for my next trick… I shall play dead! I think we’re single handedly keeping the two fish stores in Westlands “afloat”—maybe they’re poisoning the fish so we have to keep coming to buy more? I don’t remember where I used to get my fish when I was a kid, but I swear those things lived for years. Are “county fair” Goldfish really just that hearty, or are we doing something wrong? 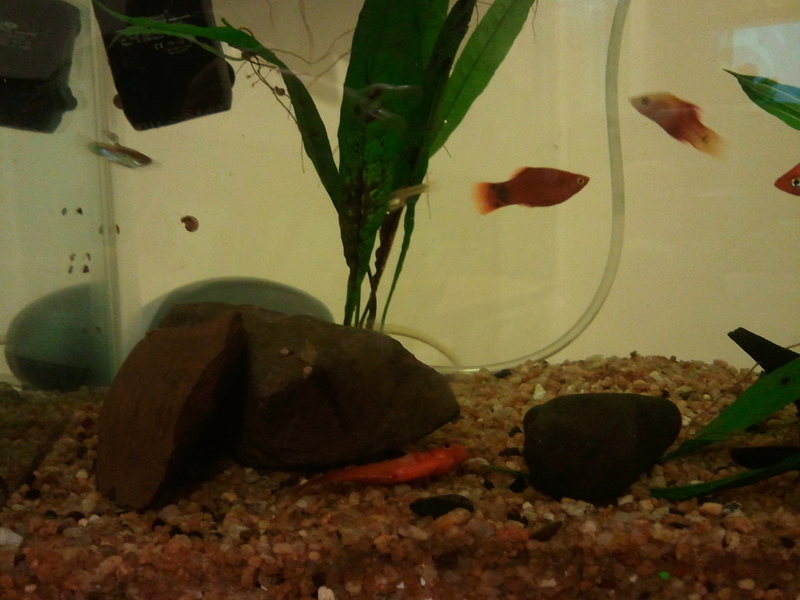 Update (1 day later): Platy died, but mother Guppy gave birth to thirteen babies—the balance has been restored! Update (2 days later): Another Platy dead. She had been very pale for a few weeks, behaving very strangely. Another Platy gave birth, though, so we’re still at a net of about ten fish! Alan, this is Bree but Randi is logged in and I don’t know how to change it! Have you guys been adding anything to temper the water? I remember from fish-keeping days of yore that I had to put something in the tap water to remove the chlorine and other chemicals that we can drink but will kill fish. It was really cheap and you only used a few drops per water changing. I think it is also highly likely that pet store fish just aren’t very healthy or well-looked after prior to going home with their new people.. I was going to suggest the same as Bree. You also have to let the fish sit in their baggie and float in the water until they get the temperature the same for them. Then you dump them in. He seemed to have a wound on his side and unfortunately we only noticed it when we got him home so I think we just bought him on his way out. We placed the bag in the water but I think the stress of moving was just too much for him, poor little guy! By the looks of it we are making the transition to guppy keeping though, its buy one, get thirteen free! You really can’t beat that!